The research team from left, Dr. Randolph Winter, Dr. Anne Wooldridge, Dr. Elizabeth Lipke and Dr. Fred Caldwell. Stem cell therapy is an emerging medical technology popularly used in the equine industry to treat horses for a variety of athletic injuries. The regenerative medicine technique uses cells from the horse’s own body to repair and speed up healing in such injuries as bowed tendons and torn ligaments, and theoretically, make the healing bond stronger. A collaborative research program involving College of Veterinary Medicine scientists and colleagues from Auburn’s Samuel Ginn College of Engineering has isolated endothelial progenitor cells in horses and is developing engineered biomaterials as a medium for delivering these cells as stem cell therapy to heal distal limb wounds. Stem cells are immature cells that do not yet have a specific job in the body, explained Dr. Anne Wooldridge, an associate professor of Equine Internal Medicine in the Department of Clinical Sciences and one of the principal investigators in the research. They can form into a particular type of cell, but they must be directed to the target and held intact long enough to survive, bond, and turn into the specific type of cell desired. Endothelial progenitor cell (or EPC) is a term that has been applied to multiple different cell types that play roles in the regeneration of the lining of blood vessels. “This is the first research initiative to isolate these EPCs in horses, and we are using our interdisciplinary expertise to develop new regenerative therapies for horses that leverage the use of stem and progenitor cells combined with engineered biomaterials as the drug delivery medium through injection,” Dr. Wooldridge said. Adequate blood flow to a wound is vital to the healing process. As runners, jumpers, prone-to-be kickers and large, heavy animals, horses tend to sustain severe cuts and other serious wounds in the distal area — the leg region below the knee and hock, Dr. Wooldridge added. Because the distal area of a horse is mostly bone and tendon, it does not contain much muscle to carry blood to the wound to promote healing. Thus, such wounds are often quite difficult to heal. Through the engineering partnership, the researchers have developed a promising way toward a feasible wound healing treatment procedure. Although the EPC therapy structure is microscopic, the example used simplistically to illustrate its appearance is a gelatin fruit salad. “Think of the fruit as the cells and the gelatin as the hydrogel scaffolding that holds them intact,” Dr. Lipke said. The group’s work, which has been underway for about six years, is grant supported by the Grayson Jockey Club Research Foundation with two primary goals: 1) to isolate the EPCs in the horse and 2) to improve ways to deliver them as stem cell therapy to enhance distal limb wound healing. The team is analyzing its research data and preparing for next steps. They hope, ultimately, to develop a medical treatment that is commonly available to the equine industry. During the six years of their research, Drs. Wooldridge and Lipke together have mentored one master’s student, three doctoral students, four undergraduate students, one Morris Animal Foundation veterinary scholar and four Merial summer scholars. Other members of this research effort include Dr. Fred Caldwell, an associate professor of Equine Sports Medicine and Surgery, and Dr. Randolph Winter, an assistant professor in veterinary cardiology, who is completing his Ph.D. at the College of Veterinary Medicine. 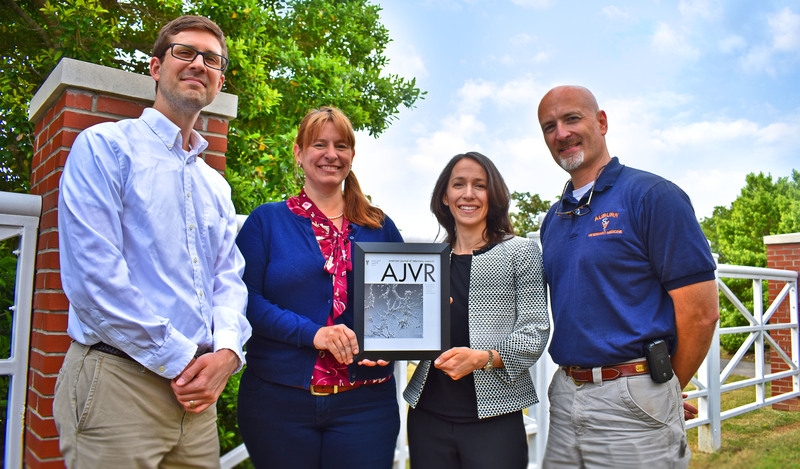 A microscopic image of their research was featured on the cover of the February 2017 issue of “AJVR (the American Journal of Veterinary Research).